William Becknell and the Santa Fe Trail. Courtesy of Legends of America. Image available on the Internet and included in accordance with Title 17 U.S.C. Section 107. BECKNELL, WILLIAM (1787/88–1856). William Becknell, known as the "Father of the Santa Fe Trade," son of Micajah and Pheby (Landrum) Becknell, was born in Amherst County, Virginia, in 1787 or 1788. He married Jane Trusler there in 1807 and was living near St. Louis, Missouri, by 1810. He saw extensive service on the frontier during the War of 1812. He joined Daniel Morgan Boone's company of United States Mounted Rangers as first sergeant in May 1813. He was promoted to the rank of ensign in July 1814, shortly after Boone's nephew, James Callaway, assumed command of the company. Becknell participated in Maj. Zachary Taylor's campaign against British-backed Indians that culminated in the battle of Credit Island, at the site of present-day Davenport, Iowa, in September 1814. He commanded the defense of Fort Clemson, Missouri, when Captain Callaway was killed by Indians in March 1815. Map of the Santa Fe Trail. Image available on the Internet and included in accordance with Title 17 U.S.C. Section 107. William Becknell Historical Marker. Courtesy of Lawrence and Sue Dale. Image available on the Internet and included in accordance with Title 17 U.S.C. Section 107. Becknell moved to central Missouri after the war and engaged in ferrying, freighting, and the salt trade. By 1817, after the death of his first wife, he had married Mary Cribbs, a Methodist from Pennsylvania, and had moved to Franklin, Missouri. William and Mary had three children. Becknell was an unsuccessful candidate for the Missouri House of Representatives in 1820. Motivated by financial problems, he organized a trading party that crossed the Great Plains to New Mexico in 1821. His party was welcomed to the previously forbidden province, and he returned to Franklin with encouraging profits. 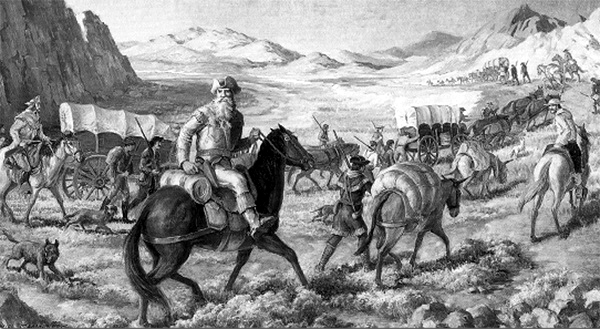 He took the first wagons across the trail in 1822 on his second journey to New Mexico, and led a party of trappers into Colorado on his third visit in 1824–25. He participated in the federal grading and marking project of the Santa Fe Trail in 1825 and 1826. He was appointed justice of the peace of Saline County, Missouri, in 1827, and was elected to the Missouri House of Representatives in 1828 and 1830 as a Jacksonian Democrat. He commanded a company of militia during the Black Hawk War. Gravesite of William Becknell. Courtesy of Ed Pryor. Image available on the Internet and included in accordance with Title 17 U.S.C. Section 107. Grave of William Becknell. Courtesy of Lawrence and Sue Dale. Image available on the Internet and included in accordance with Title 17 U.S.C. Section 107. In 1835 Becknell moved to Red River County, Texas. He mustered a company of mounted volunteers known as the Red River Blues in July 1836. The unit served along the Lavaca River until October. In that month Becknell reported to the capital of the Republic of Texas, believing that he had been elected to the House of Representatives, but relinquished his place when Collin McKinney arrived from Red River County with a greater number of votes. Becknell subsequently commanded Red River militia companies in 1838, 1841, and 1842. Though he entered regional folklore as the foolish farmer who traded 1,000 acres of fertile land for a supply of antifever pills, he amassed a sizable estate in land and livestock in Red River and Lamar counties. He also owned a bridge spanning the Sulphur River. He was appointed to supervise the Texas congressional elections of 1845, and the United States congressional elections of 1846. Becknell died on April 25, 1856, and was buried near Clarksville. Larry M. Beachum, William Becknell, Father of the Santa Fe Trade (El Paso: Texas Western Press, 1982). Handbook of Texas Online, Larry Mahon Beachum, "BECKNELL, WILLIAM," accessed April 19, 2019, http://www.tshaonline.org/handbook/online/articles/fbe17.